So, some big news around here. Girls can be Stormtroopers now! Of course, maybe they've always been able to be Stormtroopers, we're not quite sure since they always wear those androgenous armor suits. But, as far as costumes go, if a little lady wanted to suit up in service for the Empire, they had to suit up in a plastic suit that wasn't designed just for them. No longer! We're proud to carry this Classic Girl's Star Wars Stormtrooper Costume, and, let us tell you, it's ready for action! Suit your girl up, and she'll be ready to storm around the neighborhood in order to obtain a significant score of trick-or-treat candy. And, if she plays her cards right, before we know it she'll be shipping off to work for Darth Vader. That's right, we're sure she'll be a top trooper on a Death Star or Star Destroyer, for whatever the latest plans of the Empire are. And, it'll all start when you hook her up with this costume! 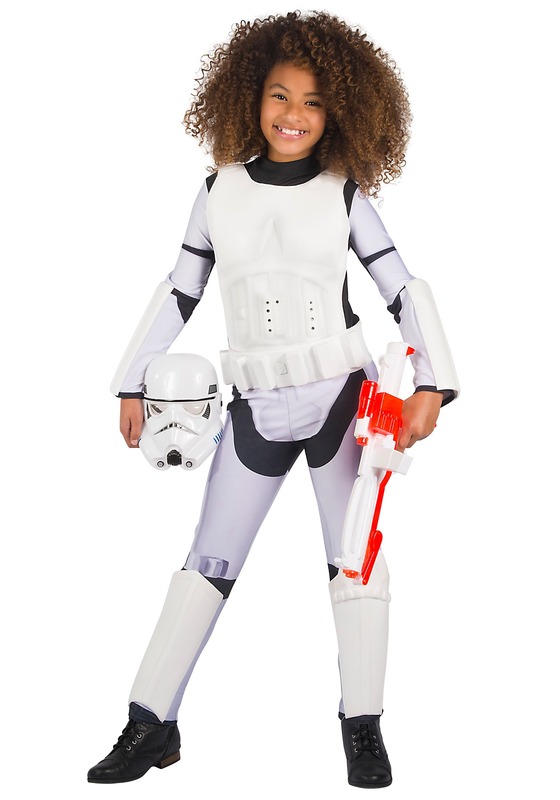 This Classic Stormtrooper costume for girls is Star Wars and Disney officially licensed. It's designed as a printed jumpsuit with plastic pieces attached to recreate the iconic Stormtrooper armor. It also comes with a plastic half-mask, so she'll be ready to suit up for duty on the Death Star. This costume is Disney officially licensed! Costume fun is a lot more interesting when you get the whole gang in on the fun, and as it happens, we're the top spot for Star Wars costumes on the web. Because we have the world's largest selection of costumes to begin with! So, we've got more than enough styles to get all her friends and family into the game. Complete the theme and get her a whole unit of Stormtroopers, and they'll be ready to storm the neighborhood in style!